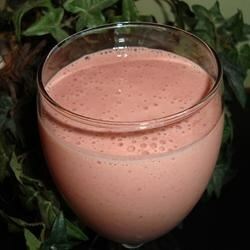 "This strawberry, banana chocolate yogurt shake makes a wonderful treat for any occasion." I wanted to just add a quick comment about freezing bananas. I use to make smoothies all the time and if you peel the banana FIRST, then freeze it wrapped in saran wrap it works great! My daughter enjoyed, used frozen strawberries and frozen banana. Added more choco. syrup and used 1% milk instead of yogurt since it was all I had. Not too sweet, but yummy. This smoothie was so good! I did have to add a splash of milk to the blender to get things moving. My husband claims it tastes like a chocolate covered strawberry, which he loves! Loved this! Just the right hint of chocolate, not too sweet. The banana adds sweetness without being noticeable, tastewise. Perfect.